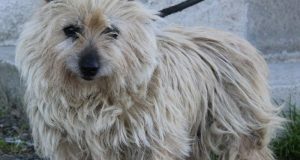 Home / Latest News / Mangy Mutts! Well, after the relative joy of the past few days, today has been far less uplifting. Last week a puppy arrived suffering from terrible mange; it was so severe that we did not even post a picture of him on Facebook. We prefer to reveal him to the public only once he has recovered enough to not scare children. He will be a beautiful looking dog once he has been treated. 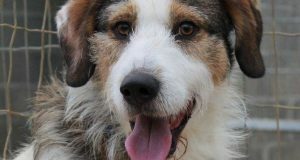 He is not the only one, though; we have had 10 dogs brought in with mange in less than a month. And today yet another pup has arrived with this condition. So I thought I would write a bit about this disease. Carole has already put a picture on the SPA Facebook page to alert our followers as to what to look out for, but for non-French speakers or non-Facebookers, here is an English explanation. 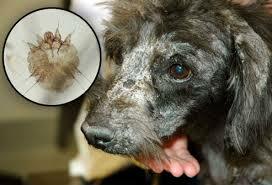 Mange (la gale in French) is a skin disease caused by tiny parasitic mites. The mites live on or in the dog’s skin, causing discomfort and coat abnormalities. It can affect both wild and domestic mammals. 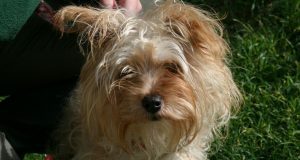 Most forms of mange are highly contagious and affected dogs become extremely itchy and suffer patchy hair loss from scratching, biting and licking. It is usually most noticeable on the ears, which can become bald at the tips, although this can be due to other diseases, too. Mange is a non-seasonal and can affect dogs of all breeds and ages. Young dogs with weak immune systems are particularly vulnerable, as are stray dogs, as they too will have weakened defences. Mange can also be passed to humans. So how do we deal with mange at the SPA? Well, clearly it is important to isolate the dog in order to stop the disease from spreading. The dog then receives a course of anti-parasitic drops and regular baths. Six weeks or so later and all is well! So if you see notices on the boxes asking you not to touch the dogs within, it is often because they are undergoing treatment. Yes, it is lovely to say hello to a dog and give him a biscuit, but if you then touch the rest of the dogs in the refuge, an epidemic can break out. Of course you may be a dog owner who is now in a panic and are worrying about how to protect your best friend against this parasite. Well if you follow these four steps, all should be well. Ensure that your dog has a healthy diet. Control all parasites regularly, such as fleas and worms. Stay current on all vaccinations. (The annual vaccination does not protect against mange, but it certainly helps with overall health). Stay alert for any signs of the disease and see a vet immediately. Finally if you see a dog with this condition, please don’t shy away or refuse to help him; he needs you! Just be sure to wash your hands as well as any bedding you may have used to transport the dog. The lovely people who brought us three of the Anatolian shepherd pups did just this. And look how beautifully they all turned out! Next: No news but good news!